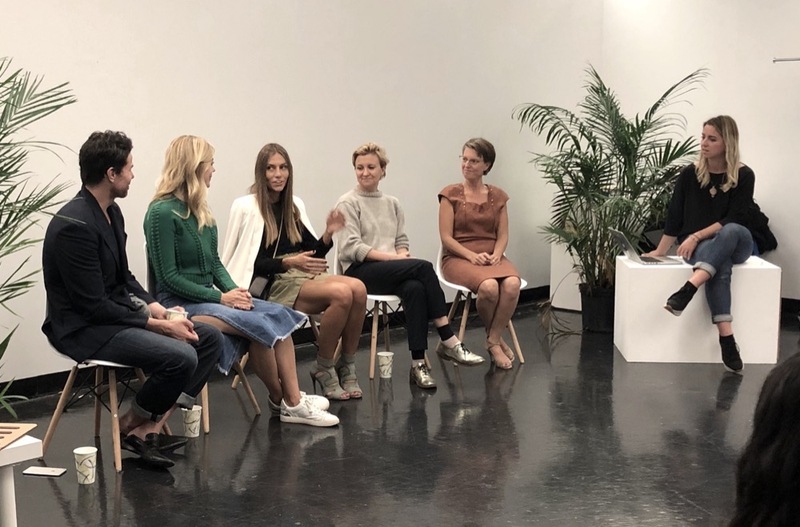 During the Balanced Fashion event Sept.27th, focused on conscious shopping, we sat down with the industry thought leaders in ethical and sustainable fashion space. Our panelists: Patrick Duffy, Founder of Global Fashion Exchange & Intandem Creatives, Anabel Maldonado, Founder of The Psychology of Fashion, Tara St James, Founder of Study NY and Production Coordinator at Brooklyn Fashion + Design Accelerator, Taryn Hipwell, the founder of Beyond the Label, the author of How to Shop for Shi(f)t, Lauren Engelke, Sustainable Fashion Stylist and moderator, Nataliya Makulova, Founder of Balanced Fashion, Conscious Fashion Tech Consultant. Here are some of the main takeaways from the panel + additional tips on how to be a conscious fashion consumer. The INDUSTRY situation. Just like any other large industry, the fashion industry is polluting, Matrix-y, unethical and full of deception, most sources agree that it is a 2nd polluting one in the world. Ever-changing styles, fast fashion brands, influencers, advertising contribute to an ever-growing consumerism. Cheap labor and toxic materials add up to the mess the industry got itself into. The shift needs to happen, it is undeniable by now. “Once you start to understand the impetus to what industry is doing you can turn the blind eye or you can start to do something about it”, said Tara St James. “You just can’t unknow things you learn about this industry”. Follow sustainable fashion blogs: Ecocult, My Green Closet, E-Luxe Magazine, The Curious Button, Eco Warrior Princess, Sustainably Chic. Subscribe to top professional resources in our space, such as Fashion Revolution, Sustainable Apparel Coalition, Global Fashion Agenda, and Ellen MacArthur Foundation. What We, As Customers Can Do? Take care of your existing clothes: if you buy something that is unethically sourced and not made of organic fabrics (like the majority of fast fashion brands’ products), you still can learn value it and take care of it so it serves you for a long period of time. Learn to fix your clothing items by attending local workshops or check out how-to-mend resources such this and this. Consider refashioning: use your creativity to find a way to reuse your old clothing items — whether it’s creating a quilt, or cropping off jeans to create shorts… there are so many ways you can still use your old clothing before tossing them! Worst comes to worst, you can always create a challenge for your designer friend and inspire them to remember their fashion school years to come up with a fun new design for an old jacket or skirt. Don’t laundry items too often. Tara St James says that we need to be more mindful about our laundry habits: “Chemicals in the detergents we use are too harsh for the clothing”, “Each time we laundry clothing, microfibers from polyester come off and end up polluting our water streams and oceans with billions of tiny plastic particles”. To prevent that, do the less frequent washing, less detergent and if you have to wash your clothes often, consider using Patagonia’s GUPPYFRIEND™ washing bags. “The most traumatic moment in a piece of clothing’s life is every time you wash it”, says Lauren Engelke, Sustainable Fashion Stylist. She suggests that you don’t really need to wash clothes after every wear. Consider wearing your jeans at least 5 times between washes, and do spot cleaning instead. Being a conscious shopper means avoiding impulse purchases. Think before you buy. 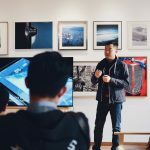 You have to start taking responsibility for your actions if you want to contribute to a positive impact on the environment and influence the industry shift. Stop shopping as a hobby, break up with fast fashion, choose QUALITY over quantity. Calculate an approximate price per wear — the cost of the item divided by the times you are really planning to wear that item. Is the product you’ll wear more than 30 times costs as much as your lunch? Then there’s definitely something’s wrong here, this product is most likely unethically made and in addition it is going to be very bad for your health. Believe me, you do pay the price for the extra cheap clothes. And if it’s not you who pays, then most definitely the person who made that item for you. For now, robotics is not as evolved, so most likely that product is made or at least finished by a human being, who hasn’t been paid a living wage. Just imagine to the suffering you’re contributing by purchasing that item and supporting that brand. Get in a habit of checking out at the label — where is it made? Usually local is means good and ethical unless you live in a third world country. Let’s talk Fabrics. Always check labels for fabrics content — it is a great way of educating yourself! Your skin is the largest organ that absorbs everything it’s exposed to. Most synthetic fibers are made of harmful chemicals, so they are bad for your skin, so try to avoid synthetics. In addition, Nylon is non-recyclable fabric, so as glitter and sequins, plus they are the sources of microplastics that pollute our environment— they drop microfibers in water streams with each wash and can cause an allergic reaction on your skin. Choose hemp, linen, Tencel, organic cotton, recycled polyester, silk, bamboo, lyocell, wool, cashmere. Know your fabrics, learn different types and their impacts on the environment. Try using Making app by Nike to educate yourself about different impact of different fabrics. Avoid buying any new leather and furs, go for vintage and repurposed skins if you want to be good to the animals. Don’t choose faux fur and leather! They are petroleum-based fabrics, like polyester, which means they are very bad for your skin when you wear them and even worse for the environment when they’re produced. Read more here and here if you want to dig deeper. Support brands that utilize organic and clean materials engage in ethical and socially responsible practices. Remember, that by choosing an “ethical” line by a fast fashion retailer, you are still supporting that company’s unethical choices. Instead, support independent fashion brands that specialize in creating an ethical and sustainable product. With every purchase, you make a vote for the future of the industry with your wallet. So educate yourself about brands that do good. There are plenty of brands to choose from, lists like this one and databases to help you navigate the sustainable fashion space. Check out Fashion Revolution’s Transparency Index for more information on ethical and transparent brands. Some of my favorite ethical shopping guide options: Balanced Fashion — coming up, Good on You, Done Good. You’ll be surprised by the range of styles, aesthetics, and prices available out there in the sustainable fashion world! Do I really need this? Why do I need this? Will I wear this item for at least 30 times before I’m tired of it or before it wears out? Will I still like it next year? What about in five years? Does this item go well with the things I already own? Do I already own something similar? Why do I need another version? Is this a high-quality fabric which will stand up to being worn and washed at least 30 times? Buy vintage or second hand when possible, attend clothing swapping events. “You may get to try things you’ve never tried before, try styles you’ve never considered and get to meet people and form friendships with owners of items you’re trying on…” — Patrick Duffy, Founder of Global Fashion Exchange. He has been swapping since 2013 and that’s how he primarily does his shopping now. “I have a group of friends, only 6–8 of us and we have swaps in each other’s apartments. We dump our clothes in one pile and everyone picks an chooses and tells a story about that item, why they no longer need it. If two people choose the same item, we make them do a walk-off” — shared Tara St James, confirming that clothing swaps can be a very fun experience. Rent Clothes — try Rent The Runway for designer rentals subscription and StyleLend for peer-to-peer rentals, and check out a recently launched For Days that embraces an innovative, circular and zero-waste business model. When you purchase a high quality 100% organic GOTS certified cotton t-shirt from them, you are automatically subscribed to swap the tee you no longer need for a fresh new one anytime you wish for just $8. They recycle those old tees into new products by breaking down the fiber and making new yarn. What else? Don’t beat yourself up if you slip up — but don’t stop trying to find alternatives. “In order to change consumer behavior, we need to understand our motivation for overconsumption and shopping.” Here’s a clue: “The motivations for overeating and overdrinking are usually the same”, shares psychologist and journalist, Anabel Maldonado, Founder of The Psychology of Fashion. Enquire within, what makes you want to overshop? There is most likely a psychological issue that is rooted in this addictive and compulsive behavior of shopping too often. Read this article from The Psychology of Fashion to understand this topic. We live to learn, explore, evolve, connect with each other, play and have fun! Remember that buying experiences rather than things is more rewarding at the end of the day. Don’t let the society, social media pressure, the industry tricks, friends comments, or your ego, affect your relationship with yourself and make you prioritize the way you look before the way you feel. Take care of yourself!